One of the most important things for users when it comes to controllers, is the possibility to select and change their preferred control method for a particular experiment or application. Not only can the instrument control on flow (mass or volumetric) whilst measuring and outputting the pressure but, by means of the front panel interface, the instrument can be instantly changed to control on pressure whilst measuring and reporting the flow. To achieve the same, other solutions on the market require a combination of several more instruments, with the complication of convoluted wiring leading back to a control panel, PC or lap-top. Not only is such a solution relatively expensive and time consuming to configure, but it is also fixed in its control mode and more limited in its capability. 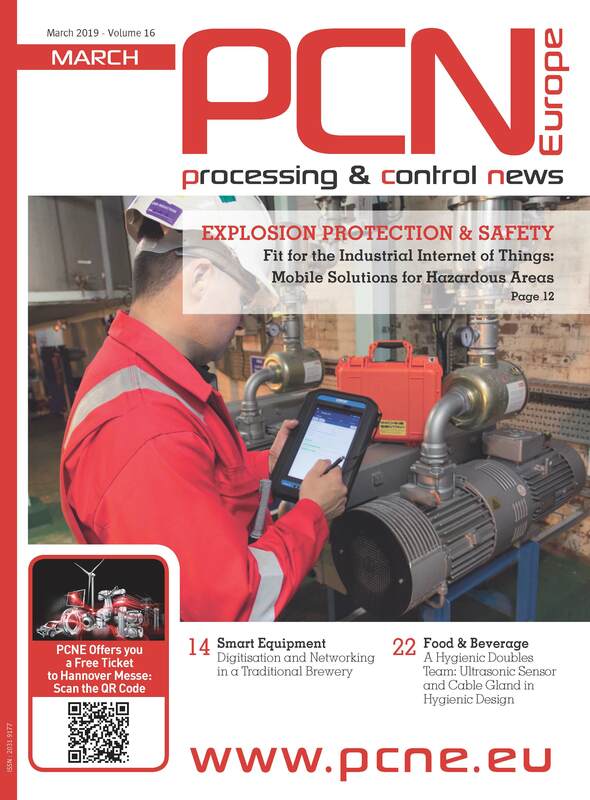 Traditional methods might include manual pressure regulators and mechanical flow measurement devices, but these are affected by changing ambient conditions, require constant vigilance, and provide no data-logging capability. Alicat’s products innovative technological features can be seen within the following application example. Reaction vessels require the addition of gases under a controlled pressure regime within such industries as chemical, pharmaceutical and biotechnology, to name but three. Multiple gas species are common-place, across a wide flow regime, with accuracy and precision often being important – especially for characterization within research and development. Rapid control response and accuracy across a broad range of gases is often critical to a successful process. Standard features of Alicat product line are of great assistance to this application. A standard turn-down ratio of 200:1 ensures that the wide flow regime can be covered by just one instrument. Depending upon the application, an even wider turn-down is possible. A lowest flow rate measurement capability of 0.0025 mln/min ensures that all gas added is accounted for – especially towards the end of the reaction. With up to 130 gas calibrations stored on-board, the direct selection of different gases maintains accuracy, reduces inventory and eliminates the issues caused by conversion factors employed by other technologies. Fast control response of between 30- and 100-ms from sensing a change to settling, ensures stability and high precision. 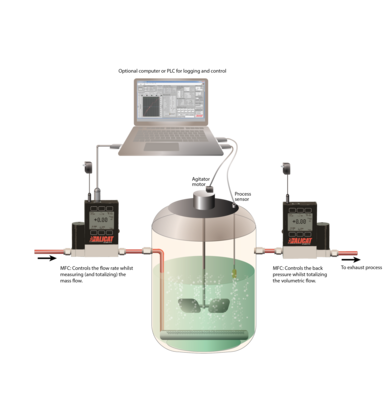 The ultra-low pressure drop available across the instrument eliminates disturbance of the process regime—especially within low pressure systems. Standard solutions, which eliminate pressure overshoot, maintain highly stable conditions for the precise control of dead-ended, non through-flow systems. 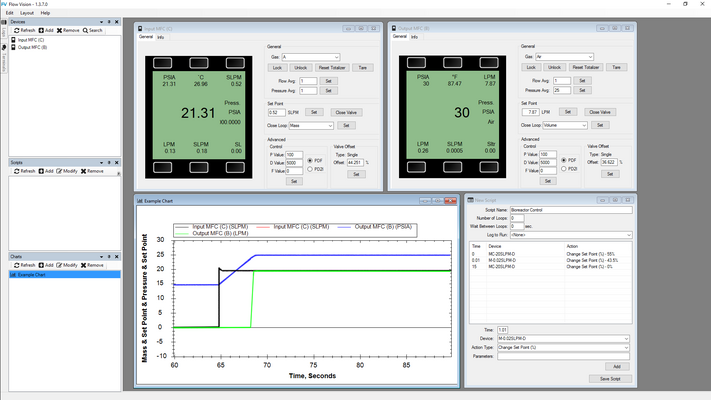 Additional software packages are available for programmable pressure profiling and batch control. All told, single-instrument measurement and control of flow and pressure are available within open flow and dead-ended systems for applications across a whole host of process industries, research, and development. These standard instruments employ time-proven, unique technology advantages to reduce cost, improve yield and save time within gas dosing and/or batching processes.